Hot Enough For Ya? 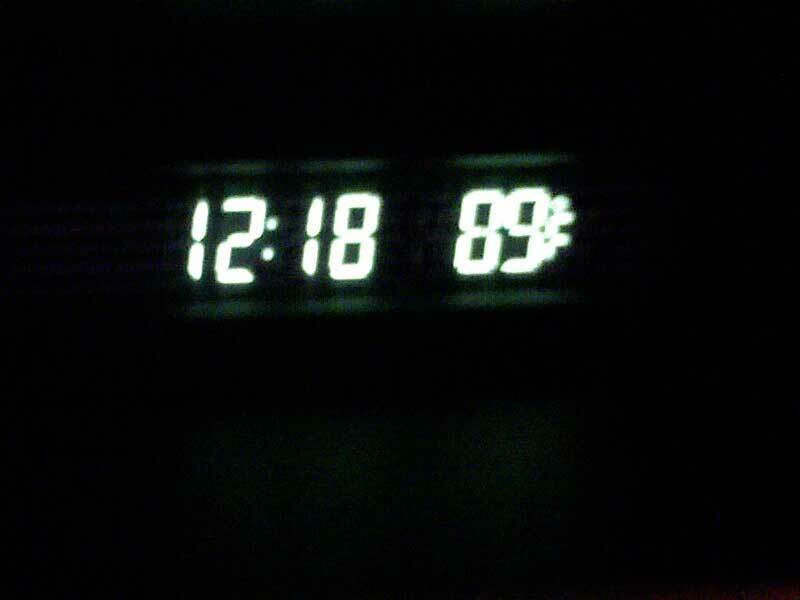 89 Degrees at 12:18 in the Morning! After exciting Southbound Interstate 5 this morning at 12:18 a.m. I noticed the temperature indicator in my car displayed 89 degrees (Fahrenheit). I was coming home from the DeVry University center in Bakersfield where I just wrapped up another successful 8-week session. This reminded me of a time when I drove into Scottsdale, Arizona for a Theta Chi Fraternity convention at about the same time of day in August (roughly 14 years ago) when it was 101 degrees. Certainly there are hotter places in the world, but it has still been just unbearable in the Santa Clarita Valley these past few days. Temperatures are expected to reach upwards of 107 degrees today and if it is 89 degrees this early in the morning, I can only imagine how hot it will be in just a few hours. Thank God for air conditioning! On Saturday, June 14, 2008 my family and I decided to visit the incredible Travel Town Museumin Los Angeles’ Griffith Park. We headed out at approximately 10:00 a.m., but once we left the house realized we needed to get gas. So, we stopped at a Shell station on The Old Road, near Rye Canyon and a stone’s throw away from the Southbound 5 Freeway. 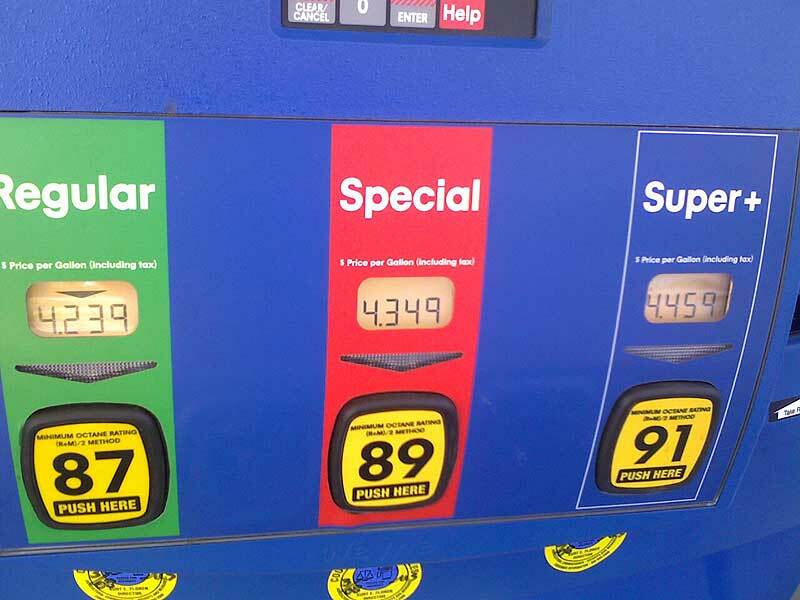 When I got out of the car to gas it up, I nearly fell over when I saw that the cost per gallon of 87 octane fuel (the “cheap stuff”) was an astonishing $4.65! I could barely believe my eyes and had to check again to make sure I had read the numbers correctly. 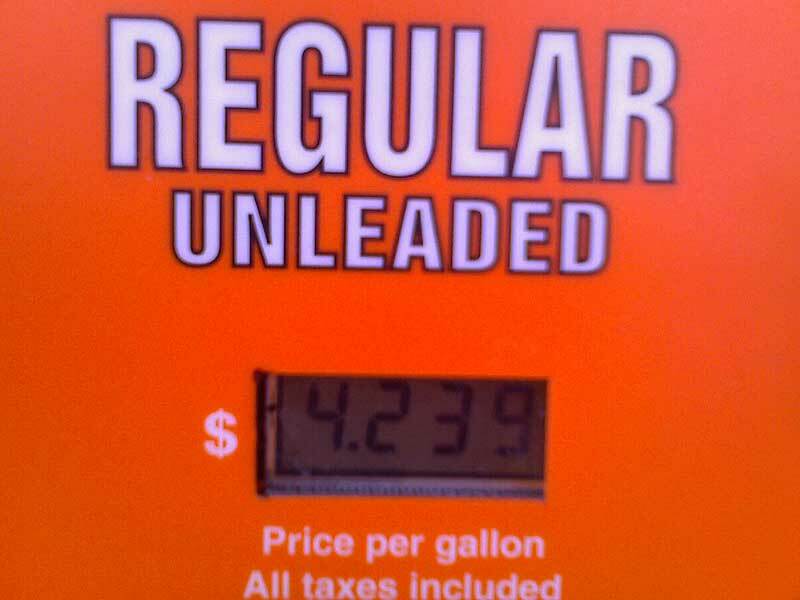 Yep, $4.65 a gallon! 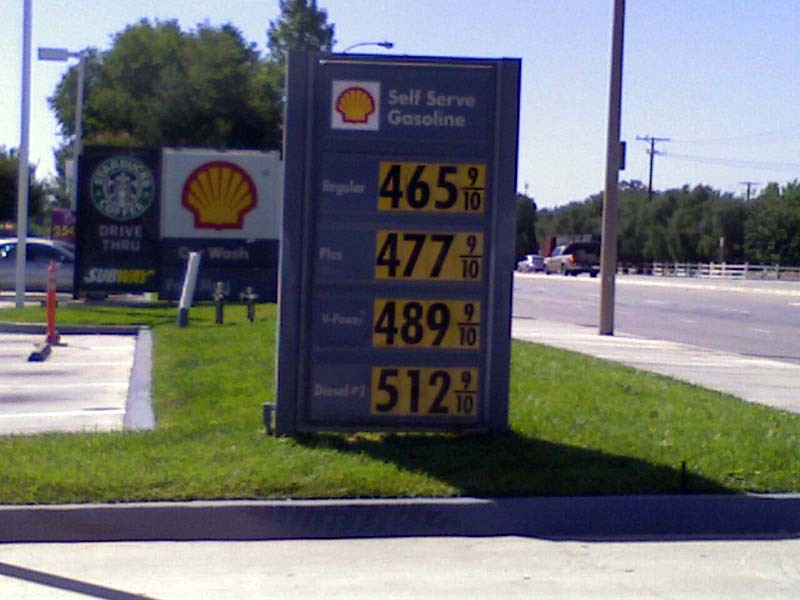 Denial: There is no way gas costs this much! Anger: This is outrageous, I am being robbed! Bargaining: Well, maybe if I just get $10 worth the prices will drop and I can fill up the rest of the tank later at a lower price? Depression: I can’t believe this, I will never be able to afford to drive anywhere again….the world is conspiring against me! Acceptance:It will be ok, gas prices will eventually even out – I have no control over the prices so why get riled up by them? 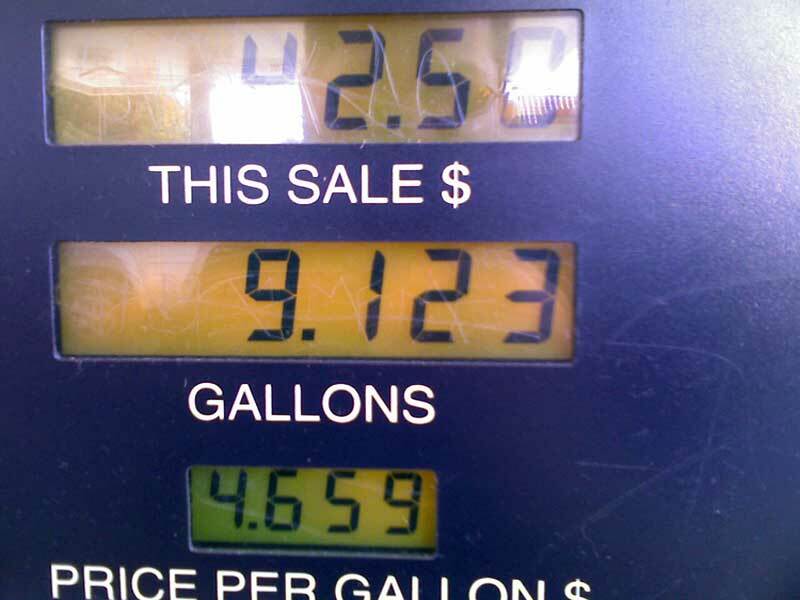 I filled up the tank with 9.123 gallons, resulting in a grand total of $42.50! A few days earlier, on May 31 through June 3 (the last two days I filled up) the per gallon cost of 87 octane fuel was $4.23 at a Mobile and 7-11 down the street from my house — which was bad enough, but crossing $4.50 a gallon seemed like an entirely different level of extortion. I’ve often heard the argument made that in some European countries gas can cost $8 to $10 a gallon, so we should be grateful that our prices are so much less. However, this argument is a fallacy, because these same European countries that have gas prices double our currently ridiculous rates are socialist — meaning that the additional cost of the fuel is intended to cover any number of social programs designed to benefit citizens of that country. Therefore, in those cases, it makes sense that gas would cost so much more. But America, being a capitalist economy, the additional cost we are now paying for fuel does not result in any equivalent increase in services made available to the citizens of the country. So, until I get free healthcare — that I would likely not want anyway, given the propencity of anything run by a government agency to foul things up — I will fail to feel “grateful” that we don’t have it any worse. Although, there is a chance I qualify for dual Italian/American citizenship — so I might just ride out this “oil storm” living with my family in a Tuscan villa zipping around on a Vespa and exclaiming “Ciao!” to everyone (props to Eddie Izzard!)! I think I am liking the sound of this! With graduation ceremonies in full bloom this time of year I felt inspired to resurrect a satirical commencement speech. I first wrote this in 1997, following a year of working surviving at my first “real job” in the corporate world after completing my BA in English from UC Santa Barbara. Years later, it still seems accurate and relevant (and is hopefully still even just a little bit funny). Note that my use of parenthesis represents a pseudo-subliminal voice I imagined using while giving the speech — meaning, that the words within them would not be subliminal at all. You’re about to make the transition from undergraduate (scourge of the academic world) to entry-level employee (scourge of the professional world) with typical, sentimental pageantry. Your family will cry with pride, your friends will smile with happiness, and you will anxiously await the commencement of the incredible future you were promised. Unfortunately, after a final night of Dionysian revelry, you will awaken to a strange, frightening, and unfriendly world. A world in which you must sacrifice all you hold dear for a paycheck, a world that strips you of your youthful vigor, a world in which a truck driver is paid more than a teacher, a world in which the glass is always half-empty. You will become that which you had hoped never to be: your parents! Don’t get me wrong, the real world isn’t totally unbearable. While there is always the potential for success, it will certainly not happen overnight. It may not even happen after ten years. And, unlike college, there is no margin for error. The blessing — and curse — of the real world, is that unlike college, there is no schedule to follow, and no way to know if you are around the corner from success, or if you have a long way to go. However, it never hurts to have a little inside information to help you deal with the slings and arrows of reality. So, in an effort to provide a public service , I thought it may be interesting, or at the very least, mildly amusing, to compare the Pros of graduation with the Cons of the real world. Pro: Income. This is the most alluring benefit to graduation. After years of surviving on ramen, an entire world of material possessions await your purchase. You can pay your own way and make your own rules! Con: Expenses. Unfortunately, once you subtract a retirement contribution; medical co-payment; supplemental insurance; and state, federal, and local taxes, you will be left with very little. Don’t forget living expenses, car payments, car insurance payments, gas, credit card debt, and the cost of other seemingly insignificant expenditures. You will soon find yourself left with barely enough money to buy a couple of ties, a package of undershirts, and some dental floss! Don’t throw away that ramen just yet. Pro: You will no longer be crammed into tiny classrooms with smelly, annoying people. I can’t count the number of times I was forced to share a room built for 100 people with 150 or more (not including dogs, skateboards, bikes, and other obstacles). Luckily, after graduation, you will finally rid yourself of these hideous conditions…or so you would think. Con: You will be crammed into a tiny cubicle with smelly, annoying people. Welcome to Cubeland! Please keep your hands and feet within the box at all times, and prepare to speak in a muffled hush for what may feel like the next millennium. You will be surrounded by fuzzy, four-foot high “walls” that wobble when you sneeze, and amplify anything you may attempt to whisper into your phone or to a co-worker. Also, don’t be surprised if your phone calls, computer usage, and innermost thoughts, are monitored. Pro: No more wasted time. How many hours did you waste sitting in a miniature desk, forced to intellectually interact with responseless, disinterested people, whose idea of learning was to sample different brands of beer during class? How many Teaching Assistants did you have to tolerate as they droned on about the Jacobins and the Girondins or, if you were lucky, something called the “homosocial circle?” Well, new graduate, time is now on your side. Con: More wasted time. All right, so I lied. Prepare for endless meetings — and meetings about meetings! You will be surrounded by responseless, disinterested people, whose idea of learning was to sample different brands of cream cheese on their bagels at the weekly department meeting. Instead of listening to a Teaching Assistant, you will endure lengthy speeches about teamwork, synergy and, who can forget, having a sense of urgency! Learn how to sleep with your eyes open. Pro: No more collegiate political correctness. During your undergraduate years you were coerced into replacing your standard language with an entirely revised vocabulary. Let’s call it Unibonics (Political Correctness). You were forced to intellectually regurgitate words and phrases like colonial imperialism, destructive consumption, capitalist oppression, words ending in “ism” and “geny,” and how could you forget, phallus. Once you spin the tassel, you can truly expand your mind and cleanse the doors of perception. Con: More corporate political correctness. Okay, I lied again. In our excessively litigious society we are no longer free to think, behave, act, or even ponder as we desire. And what is the evil word that brought about this Orwellian nightmare? LIABILITY. In response to this litigation fascination, you will be subjected to a barrage of rules and regulations. Everything from sexual harassment policies, to dress code standards that would make Mr. Blackwell proud. Don’t trust anyone, and remember, if there’s no proof, deny everything. Pro: No more obnoxious professors and university employees. How many times have you paitently waited at a university office to settle a dispute, only to be turned away because the clock has struck twelve and everyone is off to lunch? How many times has a professor treated you like an intellectual inferior, when it is you (or perhaps, your parents) who pay his or her graciously tenured salary? How many times have the Parking Police cited you unjustly, or just rudely? Fortunately, after graduation, you can blow a kiss goodbye to these insensitive buffoons. Con: More obnoxious supervisors, managers and vice presidents. Once you don your corporate monkey suit, you will become the target of surprisingly sadistic superiors. While you may get along with your colleagues or even like your supervisor, when it comes to performance reviews, disciplinary action, or other work related issues, your manager is still your manager. Read up on Lao Tzu and prepare for war! Pro: No more academic sycophantic antics. From midterms to finals, term papers to homework assignments, it is made clear that your main purpose as an undergrad is to massage the egos of your professors and TAs. Most professors demand total submission to their ideas, beliefs, and interpretations. Contradicting them can result in a low, or non-passing grade. Not surprisingly, most college graduates have never conceived of an original thought. Con: More corporate sycophantic antics. As you enter the real world, you will rapidly descend from the noble perch of intellectual investigation to the entirely insipid nadir of utilitarian unrest. You will lose the ability to develop independent, creative thoughts, and will instead concern yourself with such trivial necessities as dry-cleaning, commuting, Day Planners, project timelines, voice mail, dry-erase boards, life insurance, and the like. Outside of work, you will become content watching television talk shows, the home shopping network, and other senseless drivel. Despite the cynicism of this speech, it is not my intention to submerge your spirits. Rather, I hope you won’t feel as surprised as was I.